Have you ever imagined a Jane Austen novel happening on an alternative reality? On a world that is not exactly as we know it? Pemberley: Mr. Darcy’s Dragon will not develop the idea on an alternative reality but you will need to have an open mind and accept that England is overrun by dragons of all shapes and sizes and that some people can not only hear, but also talk to them. 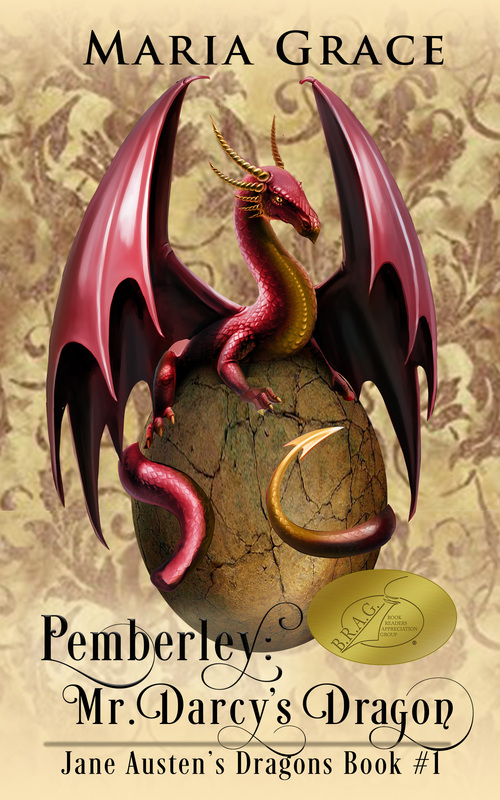 These special people with what is called a preternatural hearing, work along with the dragons, who may take the shape of a bird or a cat, in order to maintain the Pendragon Treaty that keeps the peace between human and dragon kind, but that treaty is at a risk when the first firedrake egg laid in a century is stolen from Pemberley. In an attempt to recover it Mr. Darcy travels to Heartfordshire where he will meet a keeper that will enchant him and his dragon: Elizabeth Bennet. If you are willing to accept this premise, I promise you will not let go of this book until you finish the trilogy! I had it on my TBR pile for ages but I was a little afraid of what I might find considering the original premise, however, as soon as I started reading it I got immersed in the story and all my fears disappeared. Pemberley: Mr. Darcy’s Dragon is so well written, and the characters so well-developed, including the several dragons in it, that I immediately felt transported into this world, and what may seem a strange reality was all of a sudden the only possible one. The character development is in fact one of the aspects I cherished the most in this book. Elizabeth is what every heroine should be in a story such as this, smart, intuitive and brave; Mr. Darcy has more to him than what people give him credit for in this first book and I am looking forward to see him surprise everyone in the second volume; each dragon was very different from the other and incredibly similar to their own keeper, I enjoyed the traits each one of them revealed and I am a little curious to learn more about Longbourn (Dragons are named after their estate); and Mary was the best surprise I had in this book! Maria Grace gave Mary the well deserved relevance she never had in Pride and Prejudice and made her one of the most important and loved Bennet sisters in this novel. I think Mary deserves the role the author gave her and once again I truly hope that we will see more of her in the next volumes. In this book you will find an original and compelling story that will grab your attention from the beginning and whose adventure and mystery is addicting. My only quibble with this book was the small amount of romance between Darcy and Elizabeth. I’m sure this is something that we will see more developed in the next books, but I would have liked to see them more in love in this first volume. If you are trying to get away from the same stories for a while and feel the need for something a little different, I highly recommend this book. It will require an open mind but the characters are true to themselves, even Mr. Bennet who got to my nerves, and you will find yourself completely rendered to it. Pemberley: Mr. Darcy’s Dragon is not like anything I have ever read and you will not regret reading it. Already have it so don’t include me in the give-a-way. I LOVED it. I flipped out when I saw the third book downloading on my reading device. OMG! I was so excited. EVERY book has something special to it. The dragons are real, they have personality, quirks and you believe. It is like they are another character not just an animal. I was amazed at how Grace did that. She made me believe. Elizabeth will blow you away as you go further into the story. I mean… intuitive doesn’t even come close… she knows… instinctively knows what the dragons think and feel. OH, what a series. I need to read this again. Lovely review Rita. I read the first two and have followed the third as a WIP. I want to reread it in the published version in order to post a review. Love this series. This series sounds so fun. Thanks for the giveaway. Thrilled for book 3! Love the dragons! Having fallen in love with dragons (Anne McCaffrey’s Dragonflight around 1970) not that many years after falling in love with the works of Jane Austen (P&P in around 1967), to say I was thrilled to find out that finally, someone was combining the two would be something of an understatement! That it was coming from the pen of Maria Grace made it even better. This entire three volume story is one of the best things I’ve read in Austenesque fiction, especially in the fantasy sub-genre. All of the non-human characters are fully fleshed out and who wouldn’t want a fairy dragon or cockatrice of their own like April, Walker or Rustle? Definitely three to add to your Wish List if you’re not sure about dipping your toes into this area. Give them a try. You know you want to! I loved your review Rita. I also have this on my TBR and was waiting for the other two before reading it. They are on my must buy next list. I thought there maybe wouldn’t be much romance between Elizabeth and Darcy in the first one and from the posts and excerpts I have read it seems to be book three before they are actually together but as you say the great writing is tempting enough. I’ve never been a fan of Dragons and P&P, but I am willing to try as your great review. I have enjoyed reading Maria Grace’s other Pride and Prejudice books. I look forward to reading her dragon series! She writes beautifully!!! I will DEFINITELY be adding this series to my reading list! Oh my! Love this idea! As an avid fantasy reader, this is riht up my alley! Love this series idea! Look so forward to reading them! Thank you for the chance to win one of these intriguing tales. I’m so excited the series is complete so I can start reading it! I’ve heard and read so many wonderful review about the series!